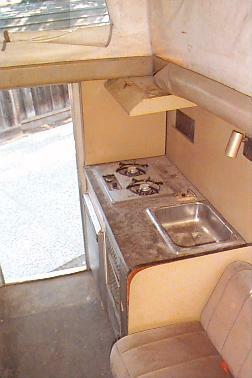 Here's some pix of the interior of my complete Chalet, Camp Koala, shortly after coming home. 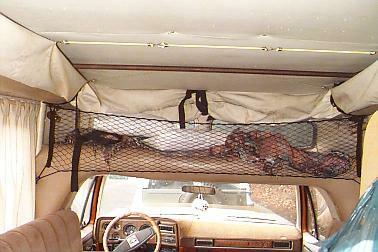 The red tie-down straps were just my temporary way of keeping the top down, so just ignore them. 1 and 2. Top and side views of the appliance unit. 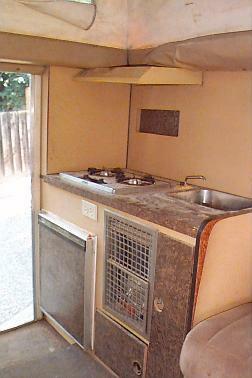 The stove and sink are on the top; the fridge on the left, the heater's in the center, and the remainder are access doors for the AC-DC converter and plumbing. 3 and 4. Closet area. 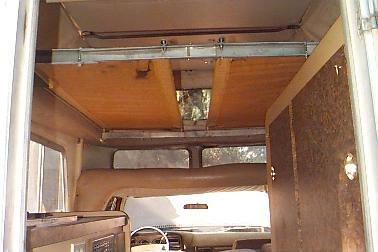 Top view shows the shelf and pocket; the forward closet door has shelves behind it. 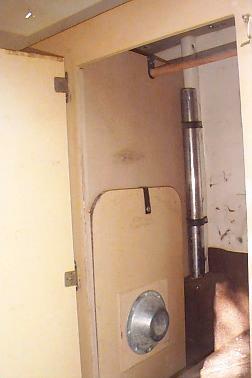 4 shows inside the rear closet, which has snaps for the table top and support leg. 5. 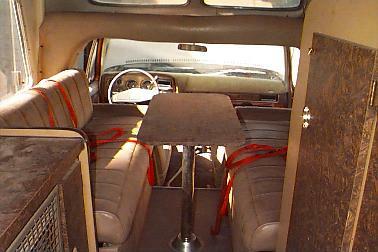 Shows how the rear camper area opens into the Blazer's cab. 1. 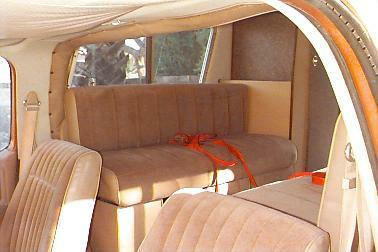 With the top popped up, there's enough room above the cab for an adult to sit. 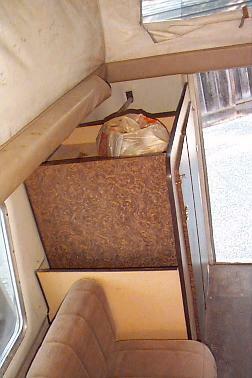 A small child could sleep here, though this area is most often used for cargo -- sleeping bags, bedding, etc. 3. 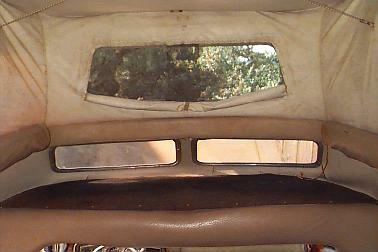 Looking in through the driver's door showing access into the camper from the cab. 4. 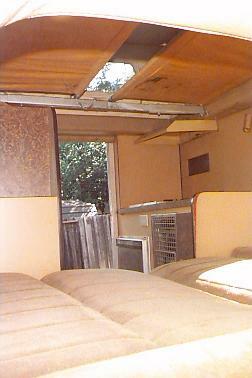 From the rear door, showing the top bunks unfolded with the bed out. 5. Here we've set up the table, with seating for a cozy four. OK, that's what I've snapped so far (that actually came out anyway ;-) If you've not seen one up close, this should give you an idea of what these trucks look like inside. Feel free to write if you want pix of some specific part. 1. 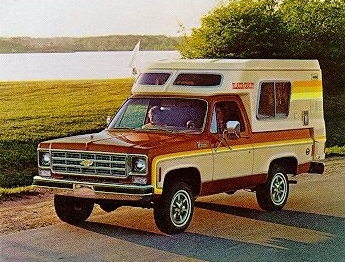 From the 1976 sales brochure for the Chalet, a nice side view of the truck with camper, and a floor plan layout of the interior. 2. One of the few period magazine advertisements to feature the Chalet. 3. 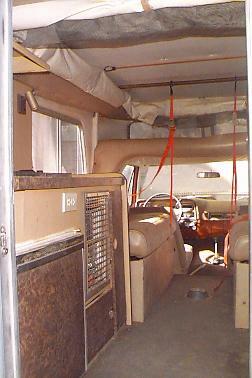 From the "Travellin' 4x4's" article (see the Paperwork page); you can see the truck with the top popped up for camping and down for travel. 4. Three of the more photogenic trucks that owners have sent in: from left to right, Hal Leedy's #100, Doug Wright's #446, and Judy Hesson's #365, all 1976 Blazer Chalets. 5. Doug and a fellow Arizona owner ('76 Chalet on a newer truck) were kind enough to take a few snaps of two Chalets in one place.